In December of 2015, I participated in a group project to compete for an internship with Disney Imagineering. My group designed a traveling theme park with the intent on bringing Disney theme park magic to the unreached corners of the United States. Our park's story focused on the power of one individual, and how any one, from anywhere can change the world and inspire future generations if they work hard and never give up. The project was conceived by the Art Center College of Design Team and created for the 2016 Walt Disney Imagineering’s Imaginations Design Competition. This project is the sole property of Walt Disney Imagineering and all rights to use these ideas are exclusive to Walt Disney Imagineering. The competition is a way for students and recent graduates to showcase their talents and for Walt Disney Imagineering to identify new talent. This is a promotional poster for the traveling theme park experience we designed. The ticket booth is made from Mahogany, a durable and lightweight wood. The pre-painted pieces interlock and fold apart to make the structure easy to setup and teardown. Our team had an idea to create a log that guests carry throughout their day, collecting stamps, tickets, character autographs, photos, etc. This was to give guests the power to shape their experience, enhance their fun and to keep a memento from the day they were inspired to do great things. Stamps and tickets correlate with different designed attractions, walk throughs and dining entertainment throughout our park. Below are the stamps, tickets, and "Dreamer's Log" I designed. Because of Walt Disney's love and history with trains, we decided to make the park entrance. The train is seemingly parked on tracks and about to head off into an american landscape. The landscape is actually a facade to keep guests from seeing the inside of the park. Once they walk through the train and step back off, they are inside the wonderful world of Walt's imagination. Our team came up with a few attraction ideas, spanning over Disneyland classics and attractions yet to be created. These were collaboration pieces in which I added the color to existing drawings. -Help guide Sven and Olaf up the mountain before Elsa arrives for her surprise party! -In the BH6 robotics lab, join the team and assemble your ideal suit by putting your skills to the test! The Haunted Mansion Fun House brings a spooky twist to a classic fun house. Get lost in the countless illusions but beware, there may be ghosts looking to follow you home. 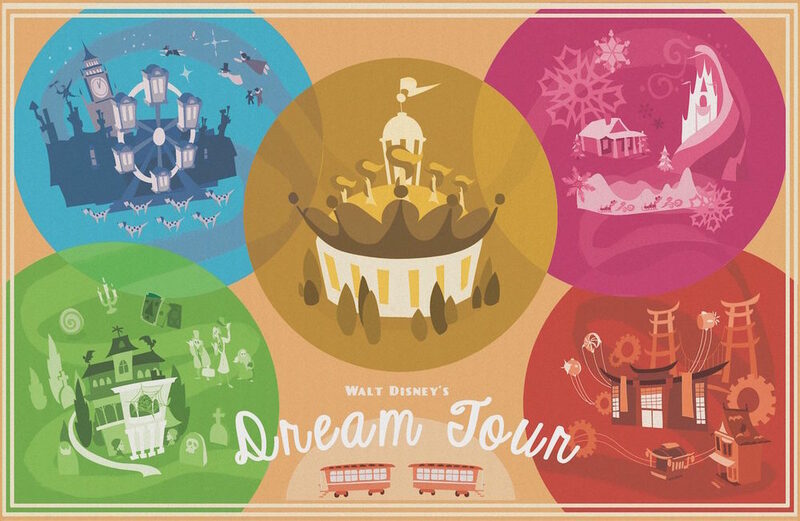 Walt's Dream for Disneyland was ignited by watching his daughters on a carousel. The spinning Zoetrope design takes this timeless attraction and transforms you into an active participant in Fantasia’s pastoral sequence. Through the queue, guests are introduced to the process of traditional animation by drawing a cycle and placing it into functioning Zoetropes. Exterior Shot: Guests step inside a working zoetrope. The top of the carousel spins with the ride. Guests ride the family of Pegasi and teach them how to fly by moving the reigns up and down. When the ride begins, Fantasia’s pastoral scene comes to life, from rough pencil sketches to a fully immersive environment. Friends and family can soar through peaks, valleys, waterfalls and gardens teaching Pegasus to fly. The guests will leave feeling like they played a role in the story and gained knowledge on the history of animation. When the day is done, you'll have your "Dreamer's Log" full of memories. Collect all the stamps and tickets to help you remember your magical experience. For the full project, click through the slideshow below.